Now that we’ve collected all of our knitting and crochet tools, it’s time to put them away in a way that’s easy for us to find later. Many of you already have a way that you store your tools that’s working well for you. But if you’re still looking for a solution, here are some ideas how others store their knitting and crochet tools. Put your most essential tools into small cases that you can easily fit in a project bag or carry with you. Last Friday, we showed several examples of knitting and crochet tool kits. 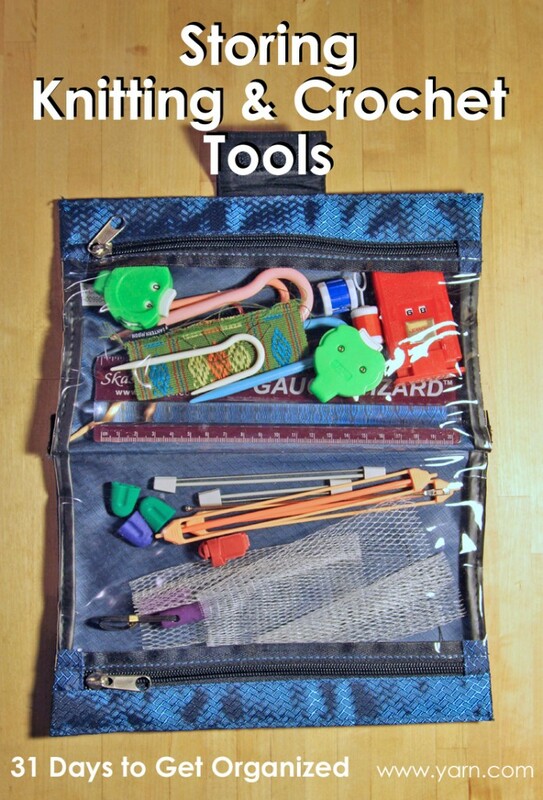 Create a few mini tool kits so you can keep one with each project you’re working on. Store small items like darning needles and stitch markers in small containers like an Altoids tin, Lantern Moon Mort Ort Bin, or the Namaste Buddy Case. Clear pouches or zipper cases are a favorite way to store tools since you can see what you have, making finding something easier. For an inexpensive version try pencil cases, or if you’re looking for something a little cuter, check out the Chic.a Clear Front Zipper Pouches available in small and large sizes, or the Namaste Oh Snap! Pouches. If you like the idea of clear storage, but need something a little bigger with more compartments, the Knit Happy Fold ‘n Go Notions Box may be just right for all your tools and gadgets. For the crafter who likes to be uber-organized, try looking at non-conventional storage solutions such as a hanging jewelry organizer with pockets, a fishing tackle bag, or a tool box. They have lots of compartments and ways to sort your tools. If you have a drawer available for storage, use modular drawer trays to keep all of your gadgets sorted and easier to find. Avoid deep boxes and storage where smaller items can sift to the bottom and get lost. Do you find that you’re continually hunting for certain tools. Keep a decorative bowl or open container near where you knit or crochet as easily accessible storage for tools that you use frequently. Also if find that you’re not very good at putting away your tools on a regular basis, consider keeping a bowl or open box near where you store your tools as a an intermediate place to collect them until you have time to put them away. 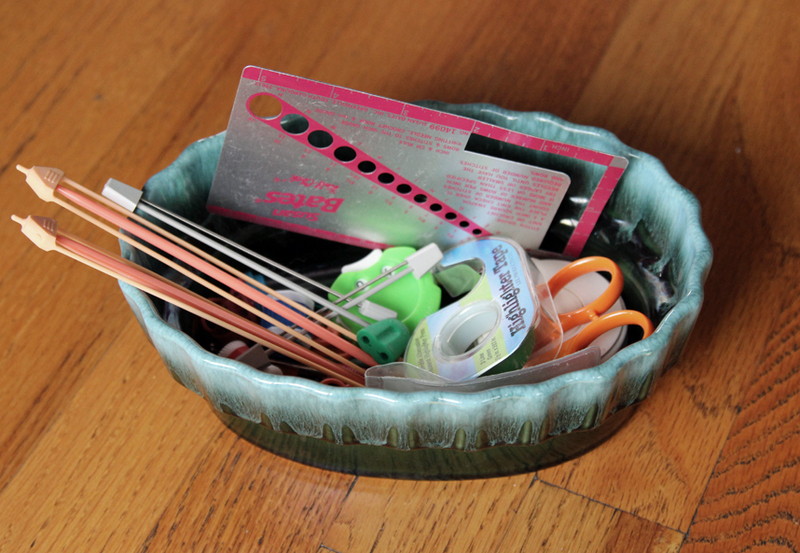 How do you like to store your knitting and crochet tools? I especially love to hear about your unconventional storage solutions. This entry was posted on Sunday, January 27th, 2013 at 10:58 pm	and is filed under Tips & Techniques. You can follow any responses to this entry through the RSS 2.0 feed. You can skip to the end and leave a response. Pinging is currently not allowed. My favorite tool kit is one of the freebie zippered cases you get with Clinique bonuses. Holds every thing I need except the knitting needles and yarn. Recycle Zippered clear plastic bags sheets and pillowcases sometimes come in. These make great project bags for on the go. I like to use the tool bags one finds at Home Depot to store my tools next to me at home. There’s one with a zillion pockets that fits over a round empty pail or waste basket. The project in progress fits in the basket, and all the tools…stitch holders, dp needles, crochet hooks, cable needles, emery boards, scissors, rulers, etc. fit into the slots around the outside of the bucket. Little things, such as markers, tapestry needles, point protectors go into a plastic box you can get in the fishing tackle dept. at sporting goods shops. Worm bags from Bass Pro are great for circular needles. I store my DPN’s in clear 9 x 1.5 plastic tubes (as seen for button storage in knit shops). I put the size on top (use a marker or cut a 1 inch circle of paper and paste on top) and have a tube for each size. I store all the tubes in a clear vase (like the ones from the florist use), standing up with numbers showing…it works great. I have the Knit Happy Fold ‘n Go & I love it. It’s relatively compact (8x4x4 in when folded) and holds an amazing amount of notions. 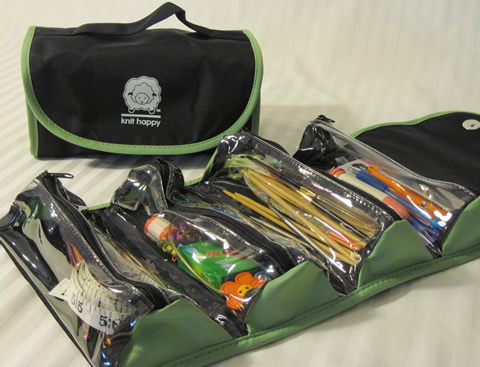 When traveling, I used zippered (plastic) pencil cases that lie flat. What is the blue organizer, a pencil case? It seems compact, yet holds several items you can readily see. I store my dpns, circulars and doo-dads in clear heavy duty plastic zip bags that have grommets in one end. (I’d found them in Cabelas in the fishing area. A friend told me about them.) I use binder rings to keep them together. Each bag is labeled with the needle size. I think pencil bags with grommets would work well like this too. I use two different types of small containers for needles: 1) clear plastic tubes which seed beads are packaged in, and 2) the tubes which hold a little bit of water and are placed on the stems of roses or other long-stemmed flowers to keep them fresh–the needles can be pushed right through the hole in the top. I’ve never had trouble with them coming out from inside. I do this, too, but one must have a source for these great tubes! I keep mine in a basket with handles, so that I can easily pull it out of the closet when I need to look through it. I use a clear mason jar to store small items like stitch holders and ring markers. The free zippered plastic bags you get when you buy sheets are good for organizing the yarn stash. I have a small sewing box/basket that has a lift out tray with little compartments for things. I can seperate the small notions like stitch markers and needle stoppers in the small compartments and put the bigger things in the bottom. The inner side of the lid is padded for a pin cushion so I can stick darning and sewing needles in it rather than have them float around. I carry epi-pens for a serious allergy, and when I have used the pens (or they have aged out) I keep the heavy plastic containers. They are great for the uber, small crochet hooks (my mother’s) and for needles. I can also throw in stitch markers if needed for my “one the road” bag. Very handy. It’s a pencil case I bought at an office supply store a few years ago. It holds quite a bit and folds in half, with a velcro closure. What you can see it that it also has holes so it fits in a three-ring binder too. Thank you. I will try to find one. I use a plastic food storage container that take out food comes in for tool storage. It sits open on my work table when knitting at home and holds the tools I use most often. It is easy to pop on the lid and take it with me when I need to gather a take along project in a hurry. Dena -love this whole series. next to my knitting chair in the family room I have one of those decorative storage boxes with the magnetic latch. it is deep enough to accommodate my small scissors standing up. I then filled it with smaller boxes and containers glued to the bottom to divide my supplies. it now holds scissors, pens, post it notes, tape measure, stitch markers, my nook and pills I need to take daily. they are all there, but it sure looks better closed up in a box. I use my old pill bottles. Needles and stitch markers and point protectors fit nicely. They are easy to throw into a bag. Different sizes can hold different things. A yarn guide, for stranding, even fits in one. I also use Altoids tins and small plastic boxes that tonometer probes came in where I used to work. Start looking at those things you empty instead of feeding the landfill! :). There are some nice containers to be had for free! My yarn bras came from work, where a customer returned gears to us in a plastic mesh and I snagged them before they got tossed! I have 2 storage areas for knitting needles. Found a cheap canvas roll up artist brush holder, in a craft store for $3. It even had brushes. I took out the brushes. and replaced with long thin knitting needles, Two needles in one slot., and there are 12 slots. Rolled it up and placed in storage bin. The other, is a decorative wine carrier. I, also found in a craft store, on sale. For shorter needles. I keep this one in living room. Looks great. You do not know knitting needles are in there until you take the lid off. .